Above, Chistopher Ford, Osage City, clears snow from a downtown sidewalk into a pickup in front of Mama Rita’s at 511 Market St., in Osage City. 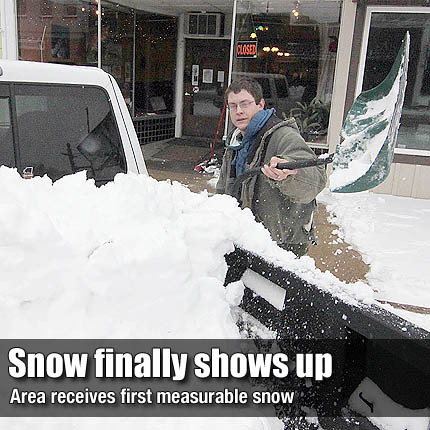 The county’s first measurable snow was preceded by flurries on a few occasions. The county received an average of 2 inches, slightly more in some areas, before melting away Tuesday afternoon. According to the National Weather Service in Topeka, Feb. 13 is the latest the area has had to wait for a one-inch snowfall.